Tall poles like this one are frustrating neighbors along South Stevens Street in North Beacon Hill. Photo provided by Anne Marie Harrington. 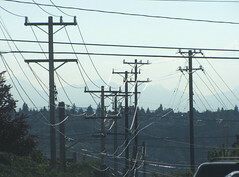 As we mentioned last week, Seattle City Light Superintendent Jorge Carrasco will be meeting with all interested neighbors this Wednesday, December 9, from 7:00-9:00 pm at the Jefferson Community Center to discuss the new power lines going up the west side of Beacon Hill and the new higher poles running along South Stevens Street. Over 100 neighbors have signed a petition asking that the poles be removed. Here are more photos of the power poles near 12th and Stevens, provided by Dulcie Claasen, Nick Papini, and Anne Marie Harrington. Addressing a fairly large crowd of 30-40 people including many new faces at the October NBHC meeting last week, Seattle City Light Superintendent Jorge Carrasco came to discuss the impact that new higher power poles and thicker cables have had on neighbors near 12th Avenue South and South Stevens, where new lines have been installed to supply additional power for Sound Transit and anticipated load growth in Rainier Valley, on Beacon Hill, and Capitol Hill. Mr. Carrasco first learned of the problems via email shortly after the new lines went up. He admitted that, while there was good engineering work done on the project, a community outreach component was not included, and that work is being performed internally at City Light to determine why a project of this size was done without input or feedback from the community. He has asked their engineering department to require that affected communities be contacted and a communication strategy be implemented before final designs are implemented for any future projects. This process, however, is not yet finalized. 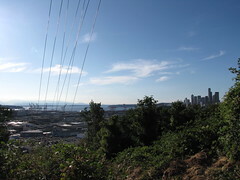 With large towers and cables going up the western bluff and along Stevens Street from 12th to 15th Avenue, design issues included soil stability issues, and whether or not lines could go underground. 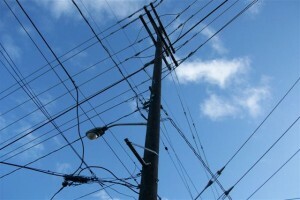 Among possible overhead wiring implementations, multiple cost alternatives were looked at. This one was chosen because other options included a mid-slope pole partway up the hillside. A mid-slope pole would have meant maintenance access issues for City Light, so they engineered around it, pulling the lines up higher and using stouter poles at the top and bottom of the slope. 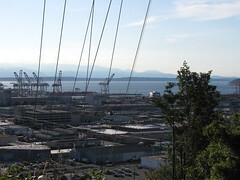 When asked why the Sound Transit tunnel was not used for the power lines, Mr. Carrasco mentioned concerns from Sound Transit as well as within City Light about having these general purpose power lines running alongside transit power lines. If there were a fire in the tunnel, it would not only damage train power but also likely cut power to a big chunk of Rainier Valley and Beacon Hill. Additionally, access for maintenance and repair would require working around the transit schedule. A buried cable option was not pursued not only due to its expense in construction and maintenance, but also because, as a utility, City Light is actually restricted from spending money for non-utility use. If undergrounding is pursued for aesthetics, the city has to chip in. As for remediation to the view blockage for neighbors nearby, a mid-slope pole alternative will be reconsidered. 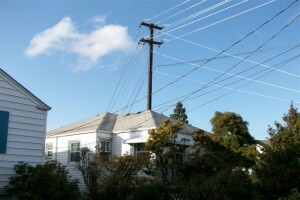 With a mid-slope pole, the pole at the top of the hill could be about 20 feet lower, however the cables would be the same thickness and run in the same number. Mr. Carrasco estimated that this change could be done fairly quickly, being completed within a month and a half to two months after work begins. This is only an option they’re prepared to look at, and City Light is interested in discussing it further, setting up another meeting, bringing some concept photos, etc. The ballpark expected cost of this alternative is about $200,000 and would be using the same cable, adding a mid-slope pole, and swapping out a shorter pole at the top of the hill. Not addressed (and seemingly not well understood by City Light when brought up during the Q&A by neighbors) is what would happen with the new, higher poles now on the plateau between 12th and 15th. Streetlight replacement also came up during the nearly hour-long conversation with Mr. Carrasco. A process of “group re-lamping” is underway in quadrants city-wide, and currently on Beacon Hill. Group re-lamping involves changing out all of the streetlights in an area at once, instead of addressing lights one at a time as they fail. This process allows for replacement in bulk every 4-5 years. The process is expected to be complete here by November 1. Judith Edwards, NBHC Chair, is working to schedule a follow-up meeting with Mr. Carrasco and City Light. We’ll keep you posted when the meeting has been scheduled. If you attended the meeting or have insights or opinions to share, we’d love to have you join the discussion at the linked Forum topic, or leave them here as comments on this article. 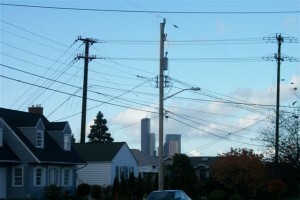 Several local media outlets have picked up a story of some neighbors on the far-west edge of the hill whose views have become scarred due to taller power poles with thicker power lines, purportedly installed by Seattle City Light at the behest of Sound Transit to accommodate the power requirements of the light rail station. 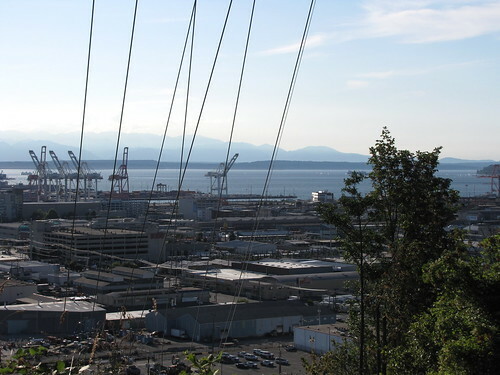 …these power lines have nothing to do with Sound Transit. We didn’t know they were going up either! This is a “betterment” project entirely the doing of Seattle City Light. Later reports indicate that City Light upgraded the service to power trolley buses and in expectation of increased demand in Rainier Valley.